I'm really surprised that there isn't more turkey hunting talk goin on . Used to be a turkey hunter but they are few and far between in Alaska! Seems as though turkey hunters aren't as common on this site as I thought they would be. 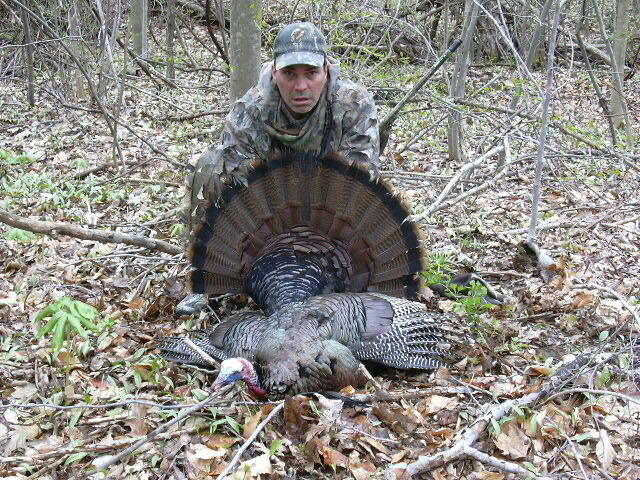 Here in North-Eastern Ohio turkey hunting has become extremely popular over the last few years. Even to the point that Rob Keck, president of the NWTF, pays a visit to the area every season. I've spent the last 4 weekends and a few strategically timed days off in the turkey woods this year. Turkey hunting is one of my favorite activities. I've never been out west to hunt elk, but from what I'm told, hunting turkey and elk are very similar. Both involve a two-way communication with the animal, something not done with deer, and a knowledge of their "vocabulary". Also, an intense knowledge of the territory, or a good guide, are a top priority. I think that if Dallen added a Turkey section that it would get more attention here. I know we are loaded with turkey hunters. I disagree that Turkey hunting is small game hunting. It's listed as a big game critter in my neck of the turkey woods. 25 Pounds is not small and neither is a two month season. We get exactly 4 weeks here, I would love to have more time. Seems as though I see more struttin just before our season and just after our season! Should we petition DAllen for a Turkey Hunting Section? Not too many turkeys in my area. But if they were here I would hunt em. which area in Manitoba, muck? There's getting to be more in the south all the time, wild pig too. I went Turkey hunting Monday, was a bust didn't see one bird, heck I didn't see anything but 2 crows and a few sparrows, I did however got a chance to shoot off a few of my Turkey loads onto a log for practice. This reminds me I need to buy new camouflaged clothing, none of it fits anymore I found out Monday when I was trying to get ready so I ended up going with a over sized shirt, and a pair of Navy blue cargo pants. I suspect that the use of navy blue is the reason you didn't see a turkey. Turkeys have VERY keen eyesight, and an uncanny ability to pick out colors. In the Eastern sub-species we have here in Ohio, a hens head is usually a pale shade of blue during the spring mating season, so the males are really "tuned in" to blues. In addition, the males heads may contain any combination of red, white and blue. The ODNR (Ohio Dept. Of Natural Resources) strongly advises turkey hunters to avoid the use of ANY garment containing red, white, blue, dark brown, or black as a safety precaution. I've been told that the males heads can change colors almost instantly, depending on their disposition, and I have seen it happen, although I have never had one answer me when I ask him why. Supposedly, a turkey with a white head is "worked up" and easier to kill, but I have taken them with both "red heads" and white ones. Any thoughts on your new camo? Any certain color or pattern you are considering? Does anyone else have strong feelings regarding camo colors and patterns? I only ask because we have had several hotly contested debates around here on the merits of camo patterns and colors (the ability of camo to hide a person)vs. ones ability to sit still and allow the camo to function as originally intended (to simply break up the human outline). Attached is last year's (2006) turkey. He was no record breaker, but was one of only 167 birds that were captured and banded statewide during the winter of 05-06. Notice the white head he was wearing. When I first spotted him, his head contained more red than white. He was "hung-up" just over a creek bed(directly to my front in the picture) for at least 20 minutes, just out of shotgun range, and by the time he found a way across the creek, his head had turned into a white signpost. I got to admit I just went out to spend time outdoors, getting a turkey was a after thought. I'm thinking of getting from Cabela's their Seclusion 3D Konifer when I get new hunting clothing now as it looks like it will make a good camouflage for around here. turkeys here are becoming more plentiful, but its only been in the past half dozen years since they've been introduced. Permits to hunt them are still on a "per draw" basis, and it takes upwards of 5-6 years to draw a permit in most cases. I as of yet, have never drawn a turkey tag to hunt them even though I see hundreds around. Turkey hunting just isnt much to talk about out here yet. Yeah, the dark closet shrinks 'em something fierce! My neighbor just popped about a 20 pounder last week, which he is taking to be mounted. Beautiful animal! About a 10" beard, and~ 1" spurs. His camo is one of Cabela's, and seemed to work, even with the checkered shirt (brown) he wore. My personal favorite is the old Woodland camo bdus, or the desert 3 color. Very durable, but what did I buy? Cabela's Seclusion Open Country, which will fit the majority of terrain around here, AND has a zipper fly. The secret is, they keep changing, to fool the hunters into parting with their $$$. But! A pair of brown or khaki trousers and shirt will blend into the woods wonderfully well. Even the old red checkered jacket and a pair of Levis work , if you break up your outline, and don't skyline yourself, and don't eat Cheetos from one of the crackly bags. Thats because they dont live here in Montana ...big sky. Everytime I drive I see turkeys and pheasants, deer staring at you. not just one or two turkeys but like a gaggle of them. what do you call a group of turkeys? ?